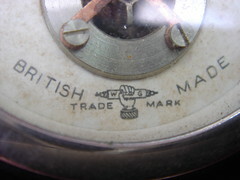 A close-up of the trade mark stamp. 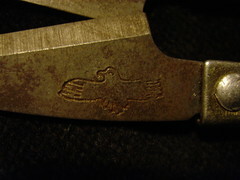 This appears on both blades. I really like these rivets. As seen from the other side..
Not much difference but I felt it needed doing. My only metal find off the Moss Farm boot sale this morning, only 20 pence. 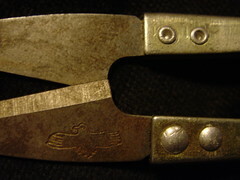 It has no writing on it, but does have a stamped bird on the blades. Which I might ty and photograph. Everyone gains weight from time to time. Now there is no need to discard shirts, trousers and skirts which have become too tight. 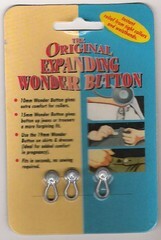 Use new Wonder Buttons to make your shirts, trousers or jeans approximately half a size bigger. 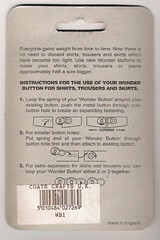 INSTRUCTIONS FOR THE USE OF YOUR WONDER BUTTON FOR SHIRTS, TROUSERS AND SKIRTS. 1.Loop the spring of your 'Wonder Button' around your existing button, push the metal button through your button hole to create an expanding fastening. Put spring end of your 'Wonder Button' through button hole first and then attach to existing button. 3.For extra expansion for skirts and trousers you can loop your 'Wonder Button' either 2 or 3 together. Instant relief from tight collars and waistbands. 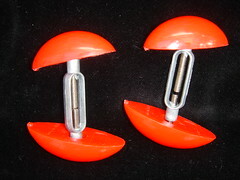 *10mm Wonder Button gives extra comfort for collars. *15mm Wonder Button gives button up jeans or trousers a more forgiving fit. *Use the 19mm Wonder Button on skirts & dresses (ideal for added comfort in pregnancy). *Fits in seconds, no sewing required. Close - up of the TRADE MARK. 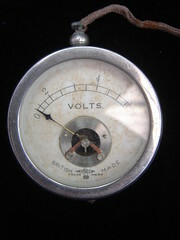 Found on a the market part of the Steam Rally at Tabley Hall a couple of weeks ago. Despite its thread bare appearance it does work. 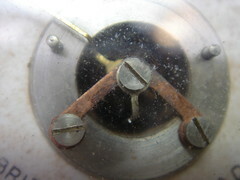 Close - up of the sprung dial. The other end of the wire. 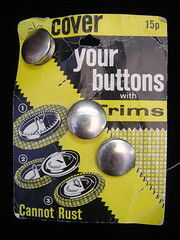 COVER YOUR BUTTONS with TRIMS. Found on a boot sale in Northwich. From an age when woman sewed and knew what basting stitch is. 1.Cut circle of fabric using pattern. Place button in centre. 2.Stretch fabric tightly over button with fingers and hook on to the teeth inside button until teeth show through. 3.Position back so that you can read 'TRIMS' Snap on back plate with finger pressure - and there's a finished button no tailor could better. May be wetted thoroughly and applied wet. 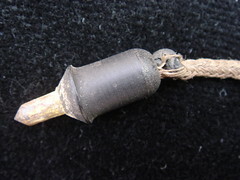 A safety pin may be used to push material into teeth. Run basting stitch round edge of circle - place button in centre and pull up thread evenly. Two thicknesses are suggested. Use a plain piece underneath cut the same size as the button. 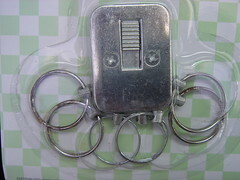 Ease off back plate with the point of a large safety pin. Remove fabric and make yourself a new button. 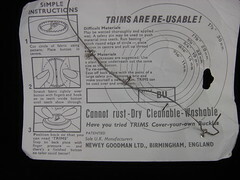 TRIMS can be used over and over again. Just to show that not everything I collect has to be old and rusty. 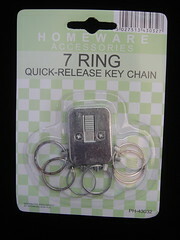 I found this Key Chain in a pound shop in Chester last week. Distributed exclusively by STONEGALLEON plc. MINI SIZED...BUT GIVES PROFESSIONAL RESULTS. The easy quick way to stretch shoes and boots in the area of the ball of the foot where tightness can cause tired and aching feet. Dampen area to be stretched, as wet leather will stretch more easily and will hold its shape more firmly when dried. 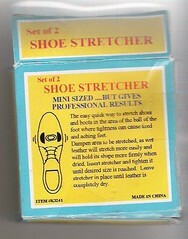 Insert stretcher and tighten it until desired size is reached. Leave stretcher in place until leather is completely dry.